Sergei Filin begins his work with police as his condition stabilizes after surgery. Sergei Filin, the artistic director of the Bolshoi Ballet, who was the victim of an acid attack on Jan. 17, has been moved out of intensive care and doctors now describe his condition as stable. With this upgrade, Filin can begin working with the police to find his attacker. Vladimir Neroyev, Chief Opthamologist of the Russian Health Ministry and Director of the Helmholtz Institute of Optical Surgery, spoke to the press about Filin’s condition. “Our institute was consulted about the burns to his eyes. Such circumstances demand both surgical and restorative treatments – everything depends on the severity of the lesions, the results of the diagnosis, and how the healing process goes. It’s a complex situation. Our priority at the present moment is to save his sight,” Neroyev said. Yekaterina Novikova, head of the Bolshoi’s press section, addressed rumors that Filin would leave Russia for treatment in Europe in comments she gave to Komsomolskaya Pravda about Filin’s condition. Novikova confirmed that the criminal investigation into the attack on Filin has intensified considerably. Anatoly Isankov, the Bolshoi Theater’s General Director, told the journalists of the worries Filin had mentioned to him on the eve of the attack. Burns specialist Dr. Andrei Vesyolov said that the burns Filin suffered in the acid attack could result in serious scarring, and that plastic surgery would be required over many operations in order to rectify the damage to his facial tissue. “If it proves to be third-degree burns, then his face will be disfigured. He may need more than one artificial face process. The process of replacement could take a great time – many years,” Vseyolov said. A conviction on this charge would carry a maximum penalty of eight years imprisonment. Police believe the principle motive is connected with Filin’s professional activities, but the police do not exclude the possibility of a domestic aspect to the attack. Filin’s colleagues have been appalled at the savagery of the incident. Despite Kaptsova’s comments, others say that the Bolshoi ballet is a less than perfect place to work and well-known Russian choreographers recalled previous cases of threats. Makhar Vaziev, now the principal Ballet-Master of the La Scala company in Milan, Italy, said that threats were made against him when we was working in St. Petersburg. Alexei Ratmansky, the Bolshoi Ballet’s previous artistic director, and currently choreographer of American Ballet Theatre, believes that the tragedy underscores the absence of theatrical ethics at the Bolshoi. “This appalling incident with Sergei Filin is no coincidence," he said. "The Bolshoi is riddled with disease – the terrible cliques that drive a wedge between the performers; black-market ticket dealers and their middle-men; half-loony fans ready to gnaw out the throat of rival stars; cynical hacks, lies in the press, and tittle-tattle interviews with the staff – it’s like a huge snowball." "The reason is the absence of any theatrical ethics – something that has eaten away at the Bolshoi for years, taking real people down with it. That’s the actual mayhem behind the scenes at our great theater,” Ratmansky added. 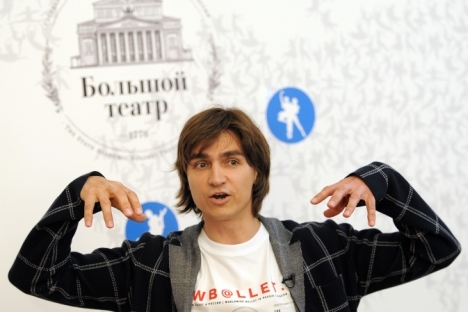 Sergei Filin, 42, is a People’s Artist of Russia. He joined the Bolshoi company in 1988, after graduating from the Moscow Choreography Institute. His roles as a dancer there included Prince Desire in “Sleeping Beauty,” Siegfried in “Swan Lake,” Albert in “Giselle,” the Prince in “The Nutcracker,” Romeo in “Romeo and Juliet,” and the Classical Dancer in “The Bright Stream,” along with many others. He has appeared as a Guest Artist with the English National Ballet, the Hungarian National Ballet, and the Tokyo Ballet. In 2008 Filin gave up his dancing career to take up the post of Artistic Director of Ballet with the Stanislavsky and Nemirovich-Danchenko Theater in Moscow. He became Artistic Director of the Bolshoi Ballet in March 2011. As Filin approached his home late in the evening of Jan. 17, a man called out his name. When Filin turned around, the man threw acid in his face and fled. Filin was rushed into surgery at the burns center of City Hospital #36 and doctors now say that he will not be permanently blind, although it is too early to speculate about the extent of the damage to his face and eyes. This report is compiled of materials from RIA-Novosti, Interfax, Kommersant, Komsomolskaya Pravda, lenta.ru and gazeta.ru.